Rice is the holy grail of grains because it offers so much versatility. Not only does it taste amazing with just about everything, it's also an easy way to get your carb fix if you need to maintain a gluten-free diet. So when that salad just isn't going to satisfy your hunger, you're simply craving something a bit hardier that's still healthy, or even if you just want something to soak up a delicious sauce, consider the rice bowl. 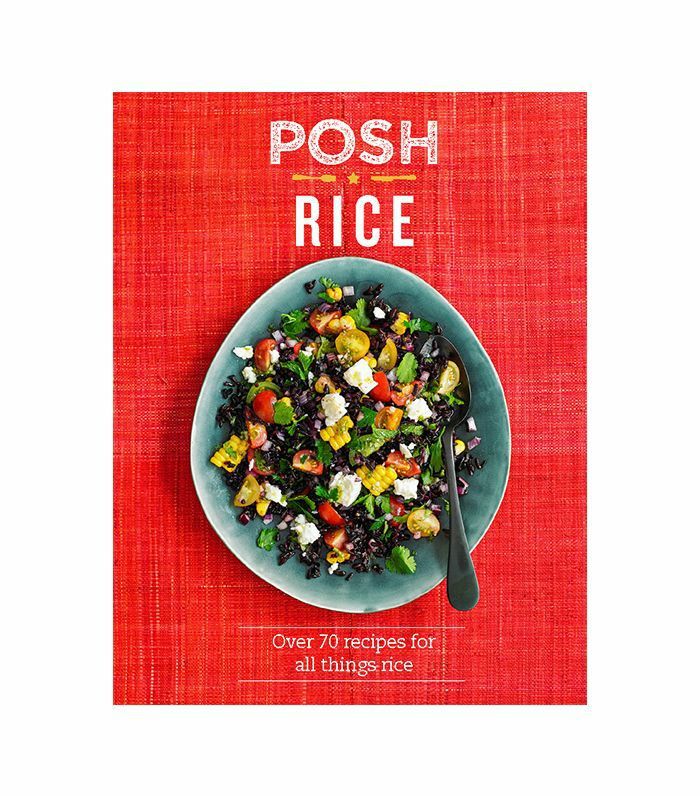 In Emily Kydd's new cookbook Posh Rice, she offers more than 70 mouthwatering recipes that all call for this hero ingredient. Though it was difficult to narrow down, we chose our four favorite recipes to highlight below so you can learn how to cook rice in a few unique ways. From meals inspired by Middle Eastern, Mexican, Asian, and Spanish cuisine, there's something for everyone. We think it'd be fun to host an around-the-world dinner party and make it rain rice by cooking all four of them. Scroll through for the full rice bowl recipes, and don't forget to shop the cookbook at the end. Note: Serves two and takes about 50 minutes. Place the chicken breast between pieces of clingfilm and, using a rolling pin, bash to 1/2-inch thick. Mix the chipotle paste, one teaspoon of the oil, the zest and juice 1/2 lime and some salt together in a bowl, then add the chicken and stir to coat. Chill for 30 minutes. Cook the rice in salted water according to the packet instructions. Heat one tablespoon of the oil in a non-stick frying pan over a high heat, add the black beans and fry for three minutes until beginning to crisp. Stir through the garlic, then tip in the rice and season well. Divide between serving bowls. Combine the tomatoes, onion, coriander and a pinch of salt in a bowl. In a separate bowl, mix together the avocado, zest and juice 1/2 lime and some seasoning. Note: Serves two and takes about 40 minutes. Tip the rice into a saucepan with some salt and pour over the coconut milk. Bring to [a] boil, then reduce the heat, cover and simmer for 15 minutes. Turn off the heat and leave to steam for 10 minutes. Meanwhile, combine the vinegar, sugar, salt and two tablespoons cold water in a small bowl. Add the onion and set aside to pickle. Rub the steak with a little oil and season. Heat a griddle or frying pan over a high heat. Once hot, cook the steak for one and a half to two minutes on each side, depending on the thickness—you want it to be pink in the middle. Set aside to rest. Note: Serves three and takes about 45 minutes. Cook the rice in salted water according to the packet instructions. Drain, then spread it out on a tray and leave to cool. Combine the herbs, spring onions, tomatoes, cucumber, allspice, lemon juice, oil and some seasoning together in a bowl. Add the cooled rice and mix well. To make the dressing, mix together the harissa, lemon juice, oil, honey and seasoning. Note: Serves three to four and takes about an hour. Preheat the oven to 400ºF. Tip the fennel, peppers, artichokes, garlic, fennel seeds, paprika and seasoning into a large tray lined with baking parchment. Drizzle over two tablespoons of the oil, toss together and spread out in a single layer. Roast for 20 minutes. Meanwhile, heat the butter and the remaining oil in a large lidded frying pan. Add the onion and cook for five minutes until softened. Tip in the rice, lemon zest and seasoning, and stir for 2 minutes. Pour over the stock, bring to the boil, then turn the heat down. Cover and simmer gently for 20 minutes, or until al dente. After the vegetables have been roasting for 20 minutes, stir through the capers and roast for a further 20 minutes. Shop Posh Rice to see the rest of the recipes, then let us know how your cooking party goes and which bowl of rice is your favorite in the comment section below. Recipes excerpted with permission from Posh Rice by Emily Kydd, published by Quadrille Publishing March 2017.